Discussion in 'Classic Manual Cameras' started by matthew_rusbarsky, Mar 31, 2011. I just picked up a Praktica TL at the local Goodwill. The body looks good, the Oreston 1.8 is flawless, but the shutter has a small issue. 500 through 30 work fine, as does B. Slow speeds below 30 default. As I change speeds with the shutter cocked I don't even hear the slow speed escapement charging. Any idea where the escapement is on the TL? Under the top deck (hope not), or under the bottom plate? Any chance of getting close to it by removing the film gate from the rear? Mathew Hi! Most of the gear in Praktica Super TL is at the bottom. You should be able to remove the bottom plate after peeling off the leatherette and removing the 6 screws that hold it fast. When you remove the bottom plate a plastic spacer at the bottom of the film cassette chamber would come loose. Make sure that you don't lose it. [If an earlier owner had already lost it then you won't find it!]. The slow speed cam and mechanism will be accessible easily, once you remove the bottom plate. Usually these are not affected by dirt or alignment problems. There is a lever and small screw that adjusts the arm of the escapement. However, I am unable to diagnose anything from this distance. Let me know if you would like any diagrams from a repair manual. All the best, sp. Here is a picture that may be of help. It is of the PL Nova 1 but the Super TL has almost the same mechanism. Best, sp. Thanks Subbarayan! When I posted my question, I thought to myself, "12:30pm in Baltimore = 10pm in Bangalore, I should hear from Mr. Prasanna in 12 hours or so..." That's good news. The escapement is in a convenient location. 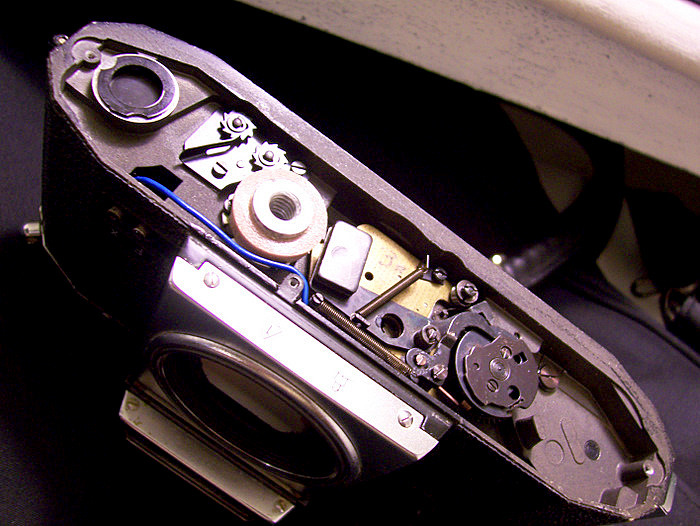 The camera works fine (on the fast speeds) so I was not willing to do an extensive tear down. First roll is in it right now, so I'll post the photos and tell you how it goes. It is a very good camera. You will enjoy it even if it works only on the faster shutter speeds. It is also quite easy to clean the curtain spindle bushes and lubricate. The tension [if needed] can be adjusted with those ratchet wheels to the left of the picture. The oblong piece in the middle is a pendulum that releases the slow speed escapement. If I remember right, it can be adjusted as to its release position, with a screw. Looking forward to your pictures. Best, sp. Hi Rick! I wish you had posted this as fresh thread in PN. That way amny of us will view it within the week. This one is in the archives and I ran into it accidentally. What you have stated happens at times when the crank handle [wind on] is loose. Pry open the indicator plate over the pivot. You will find a ring nut with two holes. Try and tighten that. In some cameras I have bought this was the problem. Once that was tightened then all speeds started working okay. I hope that is the problem. sp.